I got a post RAGBRAI greeting from WooDog. His parting bit of encouragement - "We are on the right side of history even if it is the wrong side of now." A couple hours later I was visiting my dentist. After expressing their shock and awe that I wasn't on a bicycle my dentist, where he usually offers the his customary caution that being right on a bicycle still means losing an argument with a car, instead noted that I was way ahead of the curve with the bicycling instead of driving. Third-ish, the opinions of this officer do not necessarily represent the opinions of the NYPD. Yesterday I was approved as a new member to the CAC of the UDC which is the MPO of the SECOG. I learned what a TEI is, but I’m not sure TEI are the right letters. I didn’t learn what a TAZ is, but I think Z is zone and the zone is a relatively small geographic region but I have no idea what zone goes with what region. In simple terms – I joined a government citizens committee dealing with transportation planning. I expect to be exposed to a lot of new concepts. It’s a three year monthly commitment. Why did they choose me? Like any organization looking for committed volunteers, most anybody with a face will do. Why did I choose them? Being involved in things that are interesting to me is a lot more interesting than not being involved in things that are interesting. To me. My participation in this committee is not exclusively framed by this non-literal question: Why is it so difficult to walk from the Empire Mall to the Empire East Mall? I've run various bikes atop my car into my garage before. Once I ran a bike into a parking garage. Many of these times are documented on this blog. Entertainment will occur locally by small bands of actors. Small groups of spectators will gather in the ruins of the great buildings. They will sit on makeshift seating made from scrap metal. The actors will perform their favorite scenes from plays long forgotten. The air conditioner will be off. And when it’s over, they will travel under their own power, some great distances, to enjoy fermented beverages and each other. 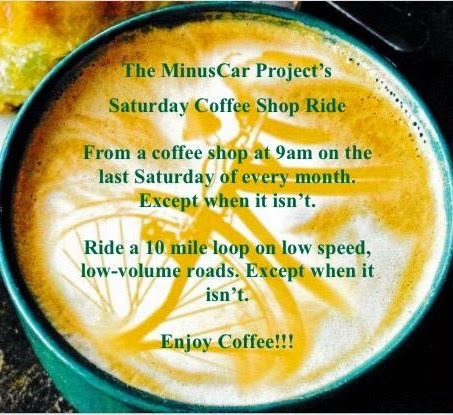 MinusCar and Snakebite invite you dear reader of Sioux Falls Bike Blogs to an evening of fine entertainment, bike riding, and conversation. The Bare Bodkins Shakespearience – a presentation of 20 select Shakespeare scenes in 90 minutes. - 6 to 6:15 – get your FREE ticket at the gate to the Queen Bee Mill. The earlier the better. - 6:15 to 6:30 – have you eaten since lunch? Get something at the scenic Falls Overlook Café. - 6:30 to 7 – find a place to sit on the bleachers. The sun sets first on those who choose wisely and quickly. - 7 to 8:30 – enjoy the Shakespearience. The Ride - travel great distance for great conversation and great beverages. - 8:30 to 10 – we’ll forego the half-mile trip to Monk’s House of Ale Repute and instead travel there by way of the airport and Yankton Trail Park. - Bring your fore and aft lightage. - Bring your knoggin protection. - 10 to 12 – I’ve heard the tales. I’ve seen the venue. I haven’t yet enjoyed the experience. Friday fixes that. Come listen politely as Snakebite regales us with tales of his recent travels to the Southwest; the highs of the Colorado Mountains and the lows of the Utah Desert. - 11:59pm – Disperse. Sleep, the death of each day's life. Make your bed and then lay in it. Enjoy a small slice of death. - 8am to 10am – meet at O’Gorman. Destination Queen City Bakery. Route TBD, except that it won’t be the direct one. This morning as I patiently poked my way through a handful of Walmartians and other parking lot pedestrians I waited as an 82-year-old man made his way across my path. I use the mile+ virtually uninterrupted sea of asphalt as a frontage road to avoid the generally unavoidable busiest intersection in the state. A few feet behind him, his 78-year-old wife locked the car and turned to see me. Funny. I dont' know why I never connect with people like that when I’m in a car. I will smile for the remainder of the day. The Wife and I went to the Bare Bodkins Theater in the Ruins of the Queen Bee Mill at Falls Park last night. It's the best thing that happened to me yesterday. 20 select scenes from Shakespeare in 90 minutes. It was amazing. I laughed. I cried. I laughed 'till I cried. Afraid of theater? Afraid of Shakespeare? This, I think, is different. It's free too - thanks to the parks department. Ride your bike. Watch the show. It's over by 8:30. Plenty of daylight to get home. Go. 1000 times go! It will be a good night. Possible - that may or can be, exist, happen, be done, be used, etc. : a disease with no possible cure. Practicable - capable of being done, effected, or put into practice, with the available means; feasible: a practicable solution. Nuance - a subtle difference or distinction in expression, meaning, response, etc. A few posts ago I said I'd write about The Mom calling me out about my bicycling related radio appearance. The radio show is old news but the topic remains relevant, so here we go. the laws says a bicycle must be ridden as far to the right as possible. I was going to interrupt to point out that what looks possible to an automobile driver is different from what looks possible from a bicycle seat. I didn't because I'd been threatened with the cutting off of the microphone and I'd already received an eye roll for interjecting clarity to what The DJ meant by “him running into a cyclist.” In this case "running into" = "happened upon." I should have interrupted. The officer was wrong about what the law says. the law says a bicycle must be ridden as far to the right as practicable. But that's nuance. Who’s got time for nuance anymore? There's a new tool in the shed. A new way to get around. I have already used it for transport, as a single occupant, multiple times. Yesterday with The Wife at work and The Boy 6 at a birthday party, The Boy 10 and I were left make up our own entertainment. I departed work and rode home to change into biker casual. I mounted the shiny new tandem and headed to the predetermined rendezvous point. The Boy 10 and I traversed roadway, gravel, and bike trail. 14 miles and one water break later we found the downtown Mama's Ladas right where we expected it to be. We partook of the tasty enchilada essence. We thefted The Wife's auto to fetch The Boy 6 from his party then returned to the scene of the crime where The Wife transported The Boys home. We're short a way to transport The Tandem so I pedaled it home pretending to be Snakebite traversing The Rockies on a big dummy. I also waited for somebody to suggest I had lost my passenger so I could count the number of empty seats in their vehicle. A quite fruitful 30+ mile day. Her - "no fair. You went for a bike ride. Now take me." And it's really great riding The Tandem together. Every time I look back to check for traffic she's there. Attached.